One modern phenomenon that has the capacity of boosting production as well as diminishes the human intervention in the production chain is robots. To the average Nigerian, robots are nothing but some mechanical configurations that are domiciled within the laboratory rooms used for experimentation. But this thinking appears obsolete as the modern engage in continual metamorphosis that seeks to further isolate the human person even when the final outcome of the efforts are geared towards enhancing the value of the collective comfort for the human race.The study of robot in the field of engineering is simply defined as an integration of electronics, electrical, computing, mechanical and material engineering, dealing with designs, manufacturing and use of robots for control, sensory feedback and information processing. In this advanced area of endeavour, robots have emerged as ‘rivals’ to human beings as far as undertaking of tasks are concerned as they can now replicate almost any form of human activity. For instance, they now popularly employed in danger prone endeavours such as bomb detection and de-activation of life-threatening activities. 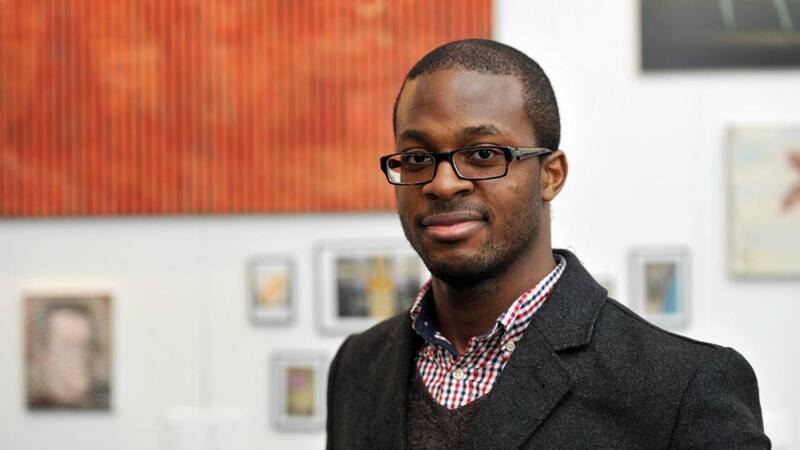 Considering the level of development of Nigeria and lack of awareness amongst Nigerians, is it not therefore antithetical that a Nigerian is making wave in robotics in the United Kingdom?Yes, a young Nigerian named Chinemelu Ezeh a force to be reckoned with in robotic engineering. Speaking on his experiences in Robotic engineering, Ezeh declared that he derives joy in a field that is seen as ‘potpourri’ as well as melting point of all engineering fields. Armed with a three-year scholarship for a Doctorate Degree in Assistive Robotics from the University College London, he is currently working to develop novel control interfaces for sharing control between a wheelchair user and a smart wheelchair. He warned against locating the reliance of Robotic engineering solely within the field of complicated engineering profession, saying that Robotic engineering finds expression in almost every field of endeavour. While tracing how a Nigerian, who went to secondary in Nigeria can ‘suddenly’ develop such a knack for complicated area of study such as Robotics, his former Mathematics teacher at the Nigeria Tulip International School, Mr Sabri Unal, explained that Ezeh’s decision to study Robotics engineering did not come to as a surprise. Back in his secondary school days, Ezeh won awards after awards as they are going out of fashion. He bagged the 1st runner-up in Abuja, in both instances in the Junior and senior categories of the Cowbell Mathematics Competition, and later emerged as Bronze medalist, Infomatrix Computer Olympiad held in Romania in 2006. He also helped programme the robot for the project that won silver in the Informatrix competition. In 2007, he emerged Silver Medalist at the Science and English Fair, which took place in Turkey, while in 2008, he placed 7th place in the Nigerian National Mathematics Olympiad. Again, he passed his WAEC/SSCE colours in 2008 with distinction and also scored 90 percent for his Advanced level studies at the Cambridge Arts and Science, Canterbury United Kingdom. Also, he was the only student that was accepted into the prestigious Imperial College London after emerging the best graduating student. He credits his parents with a very hands-on approach to raising their children. “They were very serious about education and so would buy us many books and educational toys. We also had many lesson teachers from a young age. They also ensured we ate healthy and they did their best to ensure we grow up with a good sense of moral judgement and character based on the way they lived their own lives,” Ezeh added. Going on to study Electrical and Electronic Engineering at the ICL between 2010-2014, where he also had a stint a Software Engineering (Trainees) in the London Geo team of Google, where he emerged with a First Class Honours. In his first year at the ICL, he was team leader of a group that designed and constructed a track-completing robot using assembly language, while in his fourth year, he built a robot from the scratch to demonstrate a navigation system, and designed a navigation system by simulating optimal control for path following of differential drive for his thesis, which centered on Design and Implementation of Control and Path Planning of Autonomous Vehicle. Following his achievements at the ICL, Ezeh was awarded a full three-year scholarship by University College London, where he is scheduled to round up later this year. The young Nigerians was amused that Nigeria and Africa by extension are yet to grab the opportunity offered by science and technology to solve the myriad of development challenges confronting the nation. He lamented: “I am surprised we do not have science based television channels that inspire people into the field. The British and Americans have many of such programmes. We have to face reality: modern civilisation is founded on science and technology. There is no other way to develop a nation. As writer and former Colorado Governor Richard Lamm said, ‘All we know about the new economic world tells us that nations which train engineers will prevail over those which train lawyers. No nation has ever sued its way to greatness’. With papers already published in academic journals, Ezeh is also President of the UCL Robotics Society, which he co-founded. But how and where did the inspiration to go into Robotics comes from? He stated that his school, Nigeria Tulip International School, not only influenced his interest, but also assisted with developing a rigorous background in mathematics and science. He added that the school encouraged willing students to broaden their horizon by participating in local and international competitions. “I gained an appreciation of science and technology through the international exposure providing by attending these competitions. Furthermore, during my holidays, I would stay back in school for advanced training in Mathematics, Physics and Informatics. It was a lot of fun because we would have a lot of social events when we were not hard at work. We studied hard and play hard,” he recalled.Ezeh said plans are underway to sustain his success story with the establishment of an organization named ‘Impactionate Ltd’ where he is the Chief Executive Officer whose aim is to primarily focus on crowd-funding for sustainable developmental projects that can be measured. He stressed that the firm, ‘Impactionate’ encapsulates his vision, saying, “Impactionate is a company born out of a desire to be the change I want to see.” A personal vision that could be transformed into a national vision that can drive the development of Nigeria may well be within sight.